I remember a time in my youth when money actually had some value left to it. When I was hired for my first job my pay rate was $4.25 an hour which was a good starting rate in 1991. I worked with a bunch of Polish nuns as a gardener at a retirement home and they treated me well, at least better than some of my bosses in later years. Now I'm making more than double that and finding it hard to make ends meet. Why? Because over the last 22 years the value of the dollar has declined sharply. In addition to this those of us left in the workforce find ourselves being taxed out of existence to support the mendacity of the welfare class, the so called "poor" of the nation who somehow seem to accrue more material goods than I can yet deign to call themselves poor. 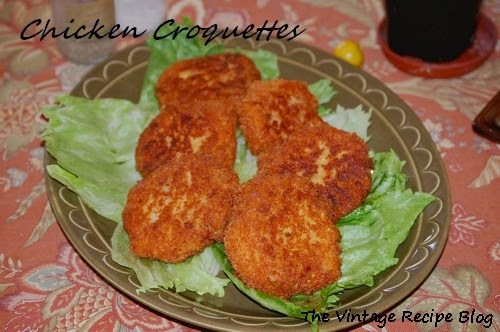 I have written about Chicken Croquettes before here but that recipe hailed from the 1930's. I found another recipe for the same thing but this one dated from 1920 and the overall ingredients were different from the 1930's recipe. The first time I made these I used leftover chicken, but I tried them again with turkey and the end result it the same. You can make a simple white sauce as an accompaniment to these or just have them as is. The vintage way to have these would have been as a luncheon with some Lettuce Salad w/ Piquant Dressing and some Banana Walnut Bread.